You can definitely tell spring is on the way and everyone is starting to get back outdoors and enjoy sporting events as I have had several requests lately for sports related invitations. 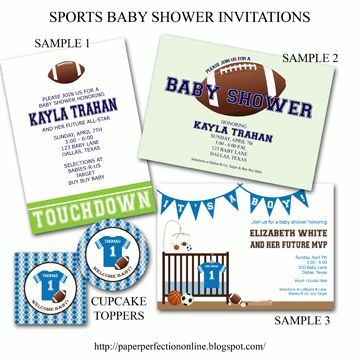 Below are several sporting style invites that I made for a baby shower. These can all be customized for the "mommy or daddy to be's" favorite sport like football, baseball, soccer, golf, volleyball, etc. I'm also including a matching cupcake topper that was designed for the event. If you would like custom party printables for your next event, one of the invitations below personalized for your event or matching party printables like cupcake toppers, cupcake wrappers, bag toppers, banner, water bottle label, candy bar wrapper and so much more contact Paper Perfection at jtanddolly@yahoo.com for pricing and details.